Dudley works as a buyer in the business office of University Housing. 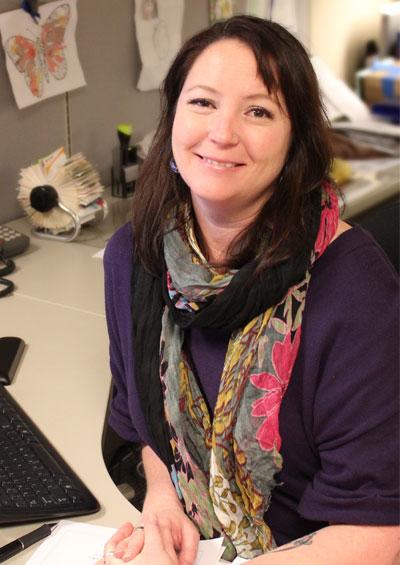 She's a Eugene native, and worked with massage table manufacturers before starting work as an office specialist, then purchasing assistant and now buyer for the housing office. Dudley manages an extensive inventory system in the residence halls, dining halls and the custodian and maintenance departments. She purchases everything from toilet paper for the residence hall bathrooms to kitchen supplies for the dining halls, and mops and brooms for the custodians. She researches products online, determines where they are most affordable and of best quality, and purchases promotional products and t-shirts for the Residence Hall Association and student staff. But Dudley points out that not everything goes seamlessly. For instance, various departments worked together to create mugs for the 2012 Winter Workshop – an annual event that University Housing hosts each year for its staff members. Dudley purchased the mugs and expected them to arrive in Eugene in time for the workshop but they were all sent to Chicago instead.